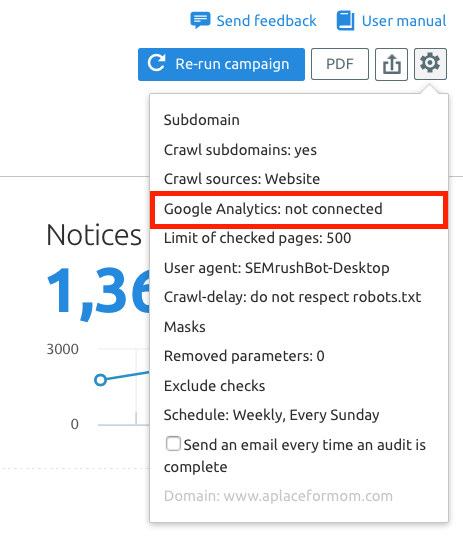 More exciting news on our technical site audit improvement — the Site Audit tool now detects orphan pages on your website and tells you how to fix this issue! With this update, you can be sure that your SEO efforts won’t be wasted and every page on your website is reachable. 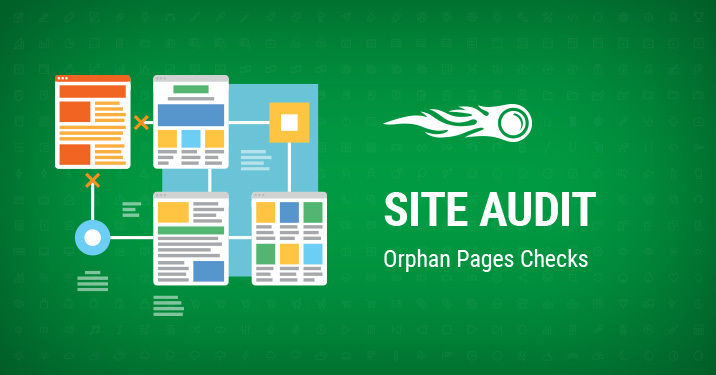 What Is an Orphan Page and Why Is It an Issue? An orphan page is a page that has zero incoming internal links, and thus can’t be reached by users or crawlers while navigating your website. As you may have hidden your landing pages this way on purpose, we don’t mark orphan pages as an ‘Error,’ but display a ‘Notice’ tag for them. They might deliver old content that you don’t want on your website and want to remove from your sitemap file, so as not to confuse both users and crawlers. They are useful and people keep visiting them via backlinks, but these pages miss out on the opportunity to receive enough traffic and link juice. If you add internal links to them, they will perform much better. They might be orphaned accidentally during a website migration. 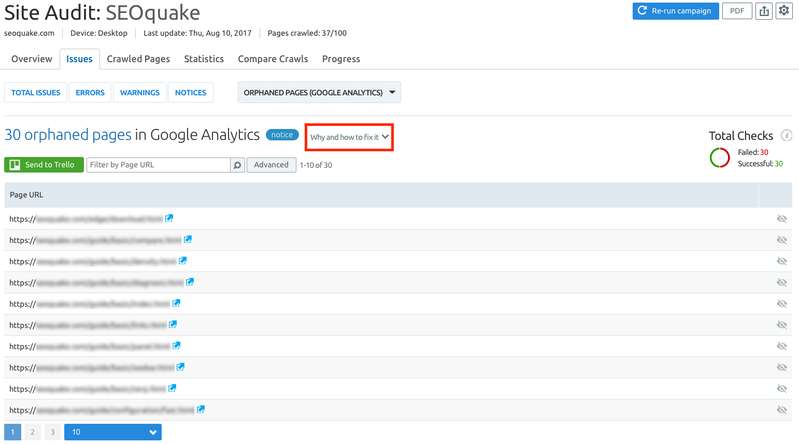 Determining if existing pages are still getting internal links is crucial. First, go to one of your projects for which you’ve set up Site Audit, and click the ‘Re-run campaign’ button at the top right corner to get fresh data. If you don’t have a project set up, create a new one, set up Site Audit and wait until your website is crawled. Then, go to the ‘Issues’ tab and click on the ‘Select an Issue’ button. Check the ‘Notices’ section to see whether Orphaned Pages checks have been triggered. This check is triggered for pages that are in your Sitemap.xml files, but don't have any incoming internal links. Click on the check’s name to get a list of orphaned pages. Hover over the ‘Why and how to fix it’ section on the right to get actionable recommendations on how to deal with these orphaned pages. This check is triggered for pages that have been recorded in GA within the last 30 days, but don't have any incoming internal links according to Site Audit crawl data. To access this check, connect your Google Analytics account by clicking on the gear wheel at the top right and following the wizard’s steps. Аfter you have connected your GA account, wait 10-15 minutes for GA data to appear. Once the check is triggered, click on the check’s name to get a list of orphaned pages. If these checks are not triggered, you can try to increase the checked pages limit in your campaign to be sure that all the pages from your sitemap or GA are crawled. Re-run Site Audit after you’ve modified your sitemap, added internal links to orphaned pages, created new pages or migrated your website in order to be sure that your pages can be found by users. If you’re aware of all orphan pages on your site, you can hide this check by clicking on the settings gear, going to ‘Exclude checks’ section and selecting the Orphan Pages checks. What do you think about this update? Share your feedback and ideas on how to improve the Site Audit tool with us at [email protected].